In my job here as Head of the School of Mathematical and Physical Sciences (MPS) at the University of Sussex, I’ve been been spending a lot of time recently on trying to understand the way the School’s budget works, sorting out what remains to be done for this financial year, and planning the budget for next year. In the course of doing all that it has become clear to me that the current funding arrangements from the Higher Education Funding Council for England (HEFCE) are extremely worrying for Science, Technology, Engineering and Mathematics (STEM) disciplines. In the old regime, the maximum income per student in Physics was thus £8,269 whereas for a typical Arts/Humanities student the maximum was £5,700. That means there was a 45% difference in funding between these two types of subject. The reason for this difference is that subjects such as physics are much more expensive to teach. Not only do disciplines like physics require expensive laboratory facilities (and associated support staff), they also involve many more contact hours between students and academic staff than in, e.g. an Arts subject. However, the differential is not as large as you might think: there’s only a factor two difference in teaching grant between the lowest band (D, including Sociology, Economics, Business Studies, Law and Education) and the STEM band B (including my own subject, Physics). The real difference in cost is much larger than that, and not just because science subjects need laboratories and the like. To give an example, I was talking recently to a student from a Humanities department at a leading University (not my employer). Each week she gets 3 lectures and one two-hour seminar, the latter usually run by a research student. That’s it for her contact with the department. That meagre level of contact is by no means unusual, and some universities offer even less tuition than that. In my School, MPS, a typical student can expect around 20 contact hours per week including lectures, exercise classes, laboratory sessions, and a tutorial (usually in a group of four). The vast majority of these sessions are done by full-time academic staff, not PDRAs or PhD students, although we do employ such folks in laboratory sessions and for a very small number of lectures. It doesn’t take Albert Einstein to work out that 20 hours of staff time costs a lot more than 3, and that’s even before you include the cost of the laboratories and equipment needed to teach physics. Now look at what happens in the `new regime’, as displayed in the lower table in the figure. In the current system, students still pay the same fee for STEM and non-STEM subjects (£9K in most HEIs) but the teaching grant is now £1483 for Physics and nothing at all for Bands C and D. The difference in income is thus just £1,483 or in percentage terms, a difference of just 16.4. Worse than this, there’s no requirement that this extra resource be spent on the disciplines with which it is associated anyway. In most universities, all the tuition income goes into central coffers and is dispersed to Schools and Departments according to the whims of the University Management. Of course the new fee levels have led to an increase in income to Universities across all disciplines, which is welcome because it should allow institutions to improve the quality of their teaching bu purchasing better equipment, etc. But the current arrangements as a powerful disincentive for a university to invest in expensive subjects, such as Physics, relative to Arts & Humanities subjects such as English or History. It also rips off staff and students in those disciplines, the students because they are given very little teaching in return for their fee, and the staff because we have to work far harder than our colleagues in other disciplines, who fob off most of what little teaching their supposed to do onto PhD students badged as Teaching Assistants. It is fortunate for this country that scientists working in its universities show such immense dedication to teaching as well as research that they’re prepared to carry on working in a University environment that is so clearly biased against STEM disciplines. I don’t see anything on the horizon that will alter this ridiculous situation. STEM subjects will continue to be stifled as universities follow the incentive to invest in cheaper subjects and will continue to overproduce graduates in other areas. The present Chief Executive of HEFCE is stepping down. Will whoever takes over from him have the guts to do anything about this anti-STEM bias? I doubt the free-market ideologues in Westminster would even think of intervening either, because the only two possible changes are: (i) to increase the fee for STEM subjects relative to others; and (ii) to increase the teaching grant. Option (i) would lead to a collapse in demand for the very subjects it was intended to save and option (ii) would involve increasing public expenditure, which is anathema to the government even if it is an investment in the UK’s future. Or maybe it’s making a complete botch of the situation deliberately, as part of a cunning plan to encourage universities to go private? This entry was posted on May 19, 2013 at 3:46 pm and is filed under Education, Finance with tags Arts & Humanities, David Willetts, Higher Education, STEM, Teaching Grant, tuition fees. You can follow any responses to this entry through the RSS 2.0 feed. You can leave a response, or trackback from your own site. I don’t think this is a problem. Some years ago physics departments were under real pressure to close and we lost quite a few. Now universities are getting back into physics, driven by student demand. The fact that we don;t make much profit on teaching may be helpfiul: private universities are unlikely to offer physics or engineering (they might offer math with some extra modules). Same for postgraduate education which you do not mention. In the end, if there is ambition to be a first-rate university rather than a second-rate company, physics will be on the menu. The larger risk is that universities try to focus on a few hot topics in STEM. EPSRC is going down that route. (And remember the university of Utrecht). It is high risk, as today’s hot topics are tomorrow’s dead ends, and vice versa. Focussing on winners leaves you unable to change direction. The situation may even worse if one adds three more factors. First, the removal of quota for ABB+ students, plus the second factor of high grades in A-levels in the arts and humanities subjects being easier to achieve, mean that there are a great number of students available to enter in arts and humanities subjects with high grades – by far the best financial plan for a university is to take as many as they can. 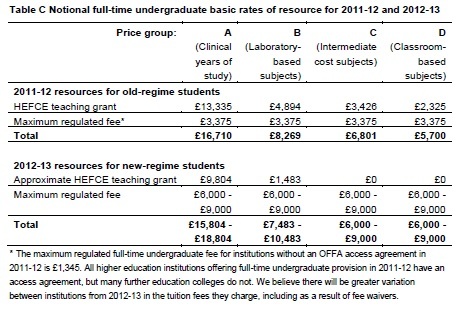 The third factor is that, when HEFCE is squeezed, as it will be, all it has left to cut is the Band A and B funding. Incidentally, my stepdaughter did a degree in the A and H at Sussex: final year – 4 contact hours, although the majority of students found that too onerous…. Indeed. The only thing I can think of that would help is to claw back £3K per A&H student from Universities into a strategic fund that is then dispersed to Band A & B subjects as an incentive to Universities to recruit in such areas. You say there is now only a small differential between AandH and STEM – but rather than indicating too little for physics it could also indicate too much is given for AandH. Do you know how much it actually costs to fund one undergraduate physics student compared to how much it costs? i.e. what is the deficit in funding and is it worse in the new regime than the old one? Depends how you count. The cost of the bursaries is charged against the fees. Without those, the true cost may be around 6k per student for an average degree. The physics studies will cost 2-3k more. The cost of central facilities (library, intranet) can be significant and those are charged against all students, so cost also depend a lot on how much a university invests on its campus. Presumably, this is a different career path than for those hoping for an academic career or one in “industry”, although some of these might be able to become science teachers. Universities certainly produce many more graduates than they themselves need (remember, on average just one student per permanent academic gets a permanent academic job himself). If there are too few science teachers, then it is because a) too few people choose this path already during university, b) it is too difficult to switch later on and become a teacher or c) people who could switch won’t. Options a) and c) might be influenced by payment, status etc. Certainly among the “failed academics”, there is the lure of real money outside of academia. Within academia, one can get by with earning less, because one is doing something one really likes, at least part of the time, and getting paid for it. Outside of academia (and I’m not including non-university schools in academia), even large salaries look small when one realizes one is selling one’s time. At least in some places, failed academics who become science teachers aren’t exactly greeted with open arms by “proper” teachers either. Probably not just the starting salary. In other words, there is probably not much hope of a substantial increase in salary during one’s career.